A Binghamton University scientist and his international colleagues report this week on the successful synthesis of the first superconductor designed entirely on the computer. Their findings were published in Physical Review Letters, the leading journal in the field. Aleksey Kolmogorov, assistant professor of physics at Binghamton, proposed the new superconductor in Physical Review Letters in 2010 and then teamed up with leading experimental groups in Germany, Belgium, Italy and France to test the prediction. The synthesized material—a novel iron tetraboride compound—is made out of two common elements, has a brand-new crystal structure and exhibits an unexpected type of superconductivity for a material that contains iron, just as predicted in the original computational study. "Paradigm-shifting superconducting materials have so far been discovered experimentally, and oftentimes accidentally," Kolmogorov says. Until now, theory has been used primarily to investigate superconducting mechanisms and, in rare cases, suggest ways that existing materials might be modified to become superconductors. But many proposed superconducting materials are not stable enough to form and those that do form are poor superconductors. Superconductors, which conduct electric current without any resistance when cooled below a certain temperature, have many interesting applications. For instance, power lines made out of superconducting materials can significantly reduce the energy lost in transmission. Superconducting magnets are also used in high-speed levitating trains and could improve wind turbines. The phenomenon of superconductivity was discovered more than 100 years ago, with breakthroughs in the 1960s bringing it into practical application in a variety of technologies. The critical temperature, or Tc, for superconductors discovered to date is between 0 and 136 Kelvin (-460 and -214 degrees Fahrenheit). This means that most superconductors require expensive cooling mechanisms. Scientists are still searching for new materials that are superconductors at higher temperatures and can be mass produced. The search revealed two promising compounds in a common iron-boron system, which came as a surprise. Moreover, graduate student Sheena Shah's calculations indicated that one of them should be a superconductor at an unusually high temperature of 15-20 Kelvin for the considered (so-called "conventional") type of superconductivity. Months of double-checking confirmed the preliminary results on the stability and superconductivity of the compound. Still, the 2010 theoretical discovery was met with skepticism. Natalia Dubrovinskaia and Leonid Dubrovinsky, professors at the University of Bayreuth in Germany, undertook a year-long series of challenging high-pressure experiments and produced a very small quantity of iron tetraboride in the predicted crystal structure, leading to the most recent journal article. Detailed measurements also demonstrated the material's predicted superconducting property and, unexpectedly, its exceptional hardness. "The discovery of this superhard superconductor demonstrates that new compounds can be brought into existence by revisiting seemingly well-studied systems," Kolmogorov says. Now that this material has been synthesized, it may be possible to modify it and raise the temperature at which it becomes a superconductor. Next, Kolmogorov plans to turn his attention to metal oxides. "They are fascinating because they have applications as catalysts, photovoltaic materials and protective coatings," he says. "We hope our predictive methodology will lead to more exciting discoveries." 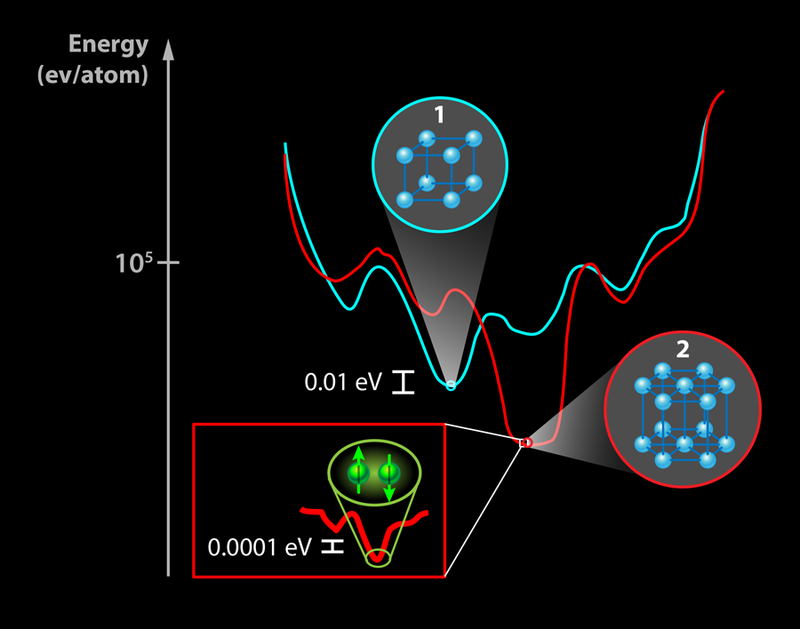 Read now: A grand unified theory of exotic superconductivity?